Product information "Geometrical Jacquard Tie - Charcoal Green - Handrolled"
The color of this tie is really unique and subtle: it's a very deep bottle green that appears almost as charcoal. Macclesfield is usually considered as the capital of screen silk printing, but it's also possible to find a few outstanding woven fabrics there such as this. The hand of this jacquard weave is a bit stiffer and drier compared to the Italian version. It's also less shiny and the overall look is just fantastic. 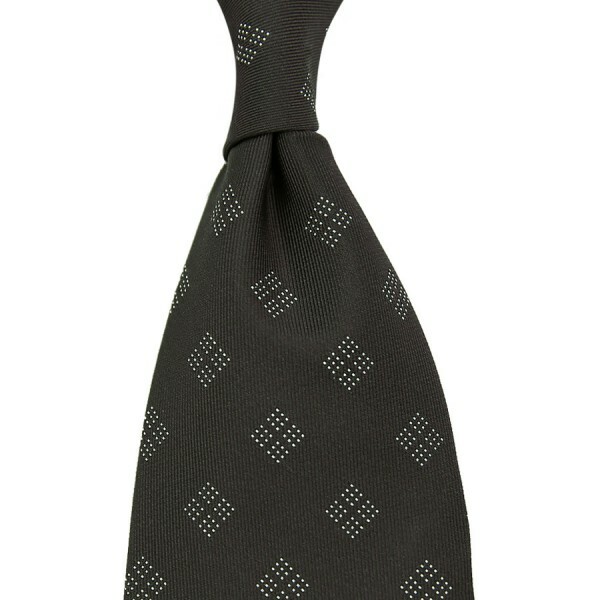 The tie knot is superb and similar to our usual repp ties. If you're into fabrics with a structure, this is definitely a great choice. Related links to "Geometrical Jacquard Tie - Charcoal Green - Handrolled"